As I stood alone on the front steps, cars honked their horns as they flew by the old stone church. I am sure I was quite the sight, dressed all in white in my Cinderella style wedding dress. I can even remember someone yelling, “Let the bride in!”. 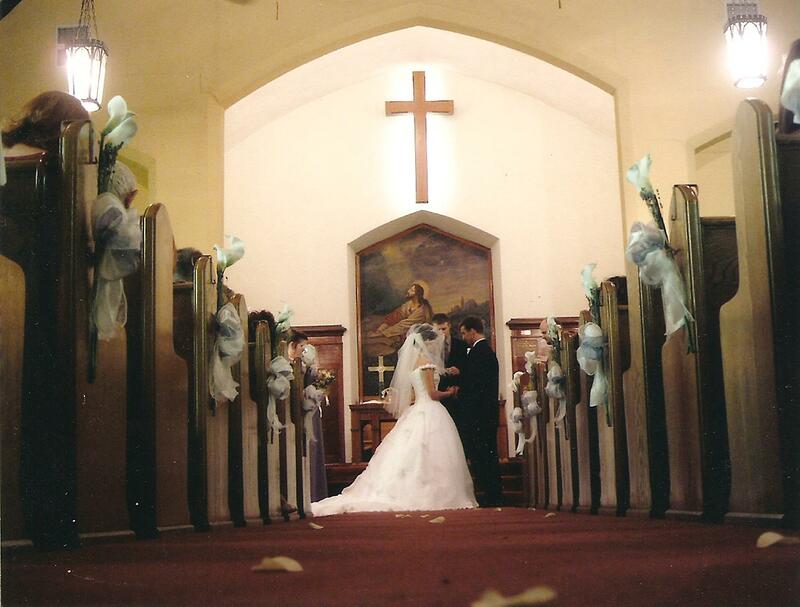 Inside the church, my bridesmaids were walking up the aisle as my best friend waited for me on the alter. Outside the church, I was a bundle of nerves as I prepared to make the biggest commitment of my life. Standing on the altar, in front of family and friends, I made a covenant with my beloved. I promised to forsake all others, to love him no matter what, to stay with him through the good and bad for the rest of our lives. A marriage covenant is the biggest commitment that most of us will ever make in this life, but it palls in comparison with the covenant that El Shadday, God Almighty has made with His people. Genesis 17 tells the story of God making a covenant with Abram. Abram is old, 100 years old and without children. God tells him that he is going to be the father of many nations and that kings will come from Abram’s line. God says, “I will establish my covenant as an everlasting covenant between me and you and your descendants after you for the generations to come, to be your God and the God of your descendants after you.” As a sign of this covenant God changes Abram’s name to Abraham. I love that God reveals himself as El Shadday, God Almighty when he makes this covenant with Abraham. What God promises is no small task and only an all mighty God is able to follow through on a covenant such as this. We make promises and break them all the time. Marriage covenants are made and broken. I know, because my parents stood on the very same altar I did and took the very same vows only to break them 10 years later. El Shadday never breaks His promises. All throughout the bible and human history we see evidence of God following through on the covenants He has made with His people. We see the fulfillment of God’s promise to Abraham in the nation of Israel. The prophets words are fulfilled in the birth and atoning death of Jesus Christ on the cross. Through Christ we now have a new covenant with God. One that we will never be able to break. God’s words will not be written on tablets as in the old covenants, but rather on our hearts. There is no longer a need for a faithful remnant to teach the unfaithful majority to know God, for all covenant partners will know Him. And most importantly, “He will remember our sin no more”. In the book of Revelation we see another wedding depicted, “Let us rejoice and exult and give him the glory, for the marriage of the Lamb has come, and his Bride has made herself ready; it was granted her to clothe herself with fine linen, bright and pure.” This time the bride is us, those who have placed our faith in Jesus for the forgiveness of our sins and the groom is Jesus Christ himself. We will forever worship, El Shadday, God Almighty, who in His ultimate wisdom and power kept the covenants that He made with His people at the beginning of all time. Will you help me be a “hero” for the children at St. Jude Children’s Hospital?